What does IR mean to you? Is it a stepping stone to the C-suite? Or are you happy to remain in IR? As the role has matured, it has grown in seniority, with many top IROs awarded a seat at the table – without having to move out of investor relations. For around a third of professionals in the field, however, that coveted CFO title remains the target, something noted by IR Magazine research in 2015. Regionally, European IROs in the study were the most likely – across all regions and market caps – to view IR as a path to another role, at 37 percent, while only small-cap IROs stood out at the other end of the scale, with 75 percent seeing IR as a stand-alone career. A study by IR executive recruitment specialist Broome Yasar Partnership at the end of last year shows little had changed. ‘Our latest research, conducted among 150 senior investor relations directors, shows that more than a third are keen to transition into a senior leadership role outside of IR over the next 10 years – a significant proportion and one we believe reflects the seniority, sophistication and ambition of today’s IRO,’ noted Oskar Yasar, managing partner of Broome Yasar. If the C-suite is your goal, what do you need to get there? 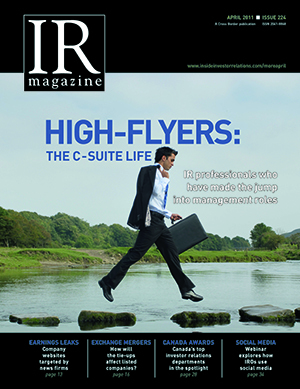 For IR Magazine’s April 2011 cover story, titled High flyers – the C-suite life, Elizabeth Judd looked at what it takes to get that corner office, talking to the likes of Blair Christie, then CMO at Cisco Systems (now a strategic adviser); Mark Begor, then president and CEO of GE Capital’s retail finance and restructuring operations (now CEO at Equifax); and David Bryson, then (and now) senior vice president and CFO at Hudbay Minerals – all of whom had come from IR. Judd also spoke to recruiters and industry experts on why IROs fit the bill at the table. ‘If you look at the people from IR who are now in C-suite roles, their mind-sets are very broad,’ explained Theodore Dysart, vice chairman at Heidrick & Struggles, an executive search firm. He added that those individuals who make the leap do more than simply interface with investors: they might collaborate with the CEO to win the company a different external placement or assume diverse challenges. ‘You need to break beyond the conventional box for the IR role in order to catch the eye of executives,’ he said. Tom Enright, then president and CEO of CIRI, observed that skills critical for an IRO are equally valued in most top executive slots. ‘In IR, you really understand what it takes for the company to succeed in the longer run,’ he explained. Couple that with a strong understanding of what affects valuation and the ability to spark a good solid dialogue with the Street and the IRO’s potential for upper management is clear.